Regardless of how dirty or not Chase Utley's leg-breaking slide was, all common sense suggests he was out. He was originally called out, but the replay review overturned the ruling when it was clear Ruben Tejada's foot missed the base. The thing is, Utley didn't make contact with the bag either. The explanation for reversing the decision is that Utley failed to touch the base because he was called out, so it doesn't matter. 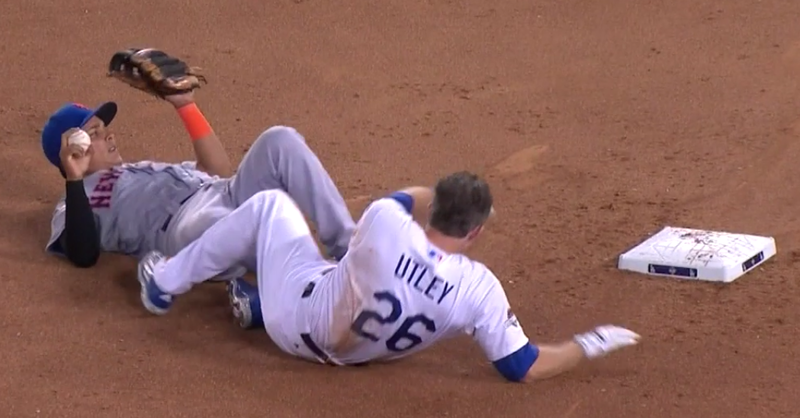 Unfortunately, there's one huge problem with that logic--if Utley was originally deemed safe, Tejada would've tagged him out immediately after he "slid" past the bag (see picture below). If he wasn't ever tagged out, how can you call him out? I get that he prob would've been tagged Utley if they called him safe ... but never did Tejada ever do anything that rules the runner out. Guessing that's why he was called safe? They called him out originally, which is why they say he didn't bother to touch the bag. But if they'd called him safe originally, Tejada would've tagged him out after he was way past the bag, in the picture. How can he be safe if he never touched the bag? What do you make of this headline?